With devastating impacts of climate change already being felt around the world, the need to act has never been more urgent. But 21 of Australia’s biggest companies are dragging us in completely the wrong direction, pursuing new fossil fuel projects and basing their business plans on the failure of the Paris Agreement. And they’re using our retirement savings to do it. These companies have had their chance to align with the goal of holding global warming to 1.5°C, but have failed to take it. They are out of line, and out of time. Tell your super fund to ditch these dirty companies, and stop funding climate destruction. I am writing to lodge a formal complaint about my super being invested in companies actively undermining efforts to avoid runaway climate change. I do not want my retirement savings funding their destructive activities. I understand 15% of the fund’s ASX 300 investments is in companies* that are pursuing fossil fuel expansion and/or basing their business on a scenario that would doom the Paris Agreement to failure. For years companies have been asked to disclose and manage their climate change risks, yet in spite of increasing calls to action from regulators and investors, these companies have continued to base their future business prospects on scenarios that deliver catastrophic climate change. There is no justification for attempting to engage these companies any further. As my super fund, you have a duty to act in my best interests. Using my money to fund climate destruction is out of line with that duty. Other super funds have taken the pragmatic step of excluding investments in certain companies whose actions are incompatible with the goals of the Paris Agreement. I ask that you do the same, and announce this decision publicly. Please respond within 14 days, detailing your plans to divest all holdings in companies that are actively undermining efforts to hold global warming to 1.5°C. I am writing to lodge a formal complaint about my super being invested in companies actively undermining efforts to avoid runaway climate change (see: marketforces.org.au/outofline). I do not want my retirement savings funding their destructive activities. 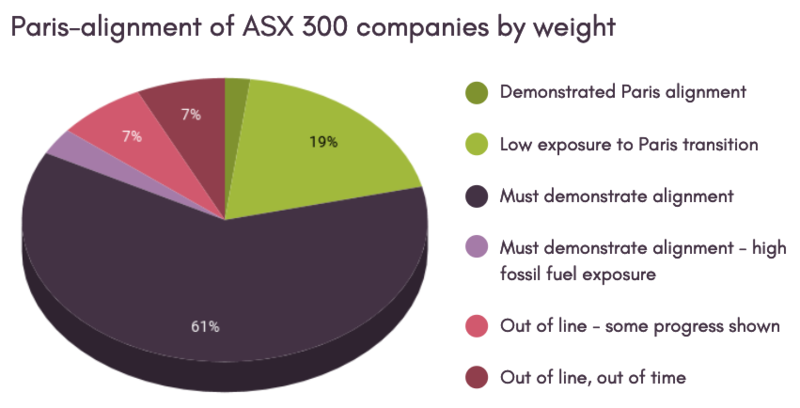 I understand at least 9% of the fund's ASX 300 investments is in companies that are pursuing fossil fuel expansion and/or basing their business on a scenario that would doom the Paris Agreement to failure. Given your limited holdings disclosure, which I would also like to complain about, I assume there is further investment in these companies hidden from members. For years companies have been asked to disclose and manage their climate change risks, yet in spite of increasing calls to action from regulators and investors, these companies have continued to base their future business prospects on scenarios that deliver catastrophic climate change. There is no justification for attempting to engage these companies any further. As my super fund, you have a duty to act in my best interests. Using my money to fund climate destruction is out of line with that duty. Other super funds have taken the pragmatic step of excluding investments in certain companies whose actions are incompatible with the goals of the Paris Agreement. I ask that you do the same, and announce this decision publicly. Please respond within 14 days, detailing your plans to divest all holdings in companies that are actively undermining efforts to hold global warming to 1.5°C. I want updates about this campaign from Market Forces! At 1.0°C of human-induced global warming we’re already seeing the devastating impacts of climate change in Australia and around the world. 2018 was Australia’s third hottest year ever. The 10 hottest years on record have all occurred since 1998, and the last 6 years all fall in that top 10. The intense heatwaves, droughts, floods, bushfires, and storms we are experiencing are all being exacerbated by global warming. Last year, the Intergovernmental Panel on Climate Change (IPCC) released its sobering 1.5°C Special Report, setting out the devastating impacts of 2°C average global warming compared to 1.5°C. The lower limit would mean hundreds of millions of people saved from climate-poverty, 10 million more people being able to live in their low-lying countries, and giving a fraction of the world’s coral reefs a fighting chance of survival. Achieving this outcome requires pulling out all the stops, including reducing coal power to virtually zero and reaching at least 85% renewables worldwide by 2050. It means no more expansion of the fossil fuel industry, and wealthy countries like Australia phasing out coal power by 2030. But a handful of Australian companies are undermining efforts to limit global warming by pursuing new fossil fuel projects, or basing their business plans on scenarios that would doom the Paris Agreement to failure. These companies have been given the chance to align their businesses with 1.5°C, but have dismissed the notion. This study identifies those companies, setting out the immediate steps investors, including our super funds, must take to play their part in holding global warming to 1.5°C. Australia’s superannuation industry invests $2.7 trillion on behalf of the nation’s workers. Through those investments, super funds own 37% of the Australian Securities Exchange. That means super funds own a huge chunk of the companies that are driving us towards catastrophic climate change. Companies like Whitehaven Coal, New Hope, Santos and Woodside. And if your super fund owns a piece of these companies, so do you! Fortunately, this gives us and our super funds a lot of power. We need to harness that power to ensure only those companies that are willing and able to be part of the climate solution see any of our hard-earned dollars. The 21 ‘Out of line, out of time’ companies identified in this study have had their chance to show they deserve a place in the low carbon transition. Not only have they failed to take that chance, they are actively undermining climate action. And they’re using the money invested by our super funds to do it! It’s time for our super funds to get our retirement savings out of the 21 ‘Out of line, out of time’ companies. 21 companies are actively undermining the Paris climate goals by pursuing new fossil fuel projects or banking on scenarios that would doom the Paris Agreement to failure. These companies make up 7% of the total value of the ASX 300. Super funds must ditch these companies if they are serious about playing their part in the fight against runaway climate change. 3 more companies (AGL, BHP and Origin) still have plans to expand fossil fuels, but have shown some progress towards aligning their businesses with the Paris climate goals. Super funds need to use their power to ensure these companies’ overarching climate statements are matched with the targets and action required to meet them. These companies have one last chance to align their business strategies with the Paris climate goals. If they fail to do this, super funds need to divest. 120 companies with considerable climate impacts have not demonstrated business strategies consistent with meeting the climate goals of the Paris Agreement. 16 of these companies are heavily exposed to the fossil fuel sector, and super funds need to warn these companies to rapidly transition to a Paris-aligned business model or face divestment. Just 8 companies have demonstrated strategic alignment with the goals of the Paris Agreement. For example, Infigen is a developer, owner and operator of renewable (wind) energy production assets 100%. The company’s strategy revolves around replacing retiring coal-fired power generation capacity in the Australian energy market with renewable sources. Property company Mirvac has also demonstrated alignment with a 1.5°C, having committed to becoming “net carbon positive” by 2030. This means the company’s operations will withdraw more carbon from the atmosphere than they will generate. 143 companies have operations and greenhouse gas emissions profiles that are not overtly inconsistent with the goals of the Paris Agreement being met. Mineral Resources is predominantly a mining services company and iron ore miner, but acquired Empire Oil & Gas in 2017, and is actively pursuing gas development opportunities in Empire’s exploration tenements. South32 has started to shift away from thermal coal production, separating its South Africa Energy Coal business and attempting to reduce its ownership in the spun-off company. But during this process, the company approved a 20 year extension to its South African Klipspruit coal mine. South32 also continues to increase its metallurgical coal production in Australia. While the company has disclosed climate change scenario analysis, its ‘base case’ would see 4°C of warming, and its most ambitious climate scenario gives just a 50% chance of limiting warming to 2°C. WorleyParsons is not a fossil fuel producer like many on this list, but provides advisory, engineering, and construction services to the fossil fuel industry and is listed in the Energy sector according to the GICS methodology. In 2018, 76% of the company’s revenue came from providing services to companies extracting and processing oil and gas. WorleyParsons’ stated strategic priorities include growth of its fossil fuel business and pursuing potential LNG opportunities. The company also refers to a number of energy scenarios to support the claim that “Oil and gas are both forecast to grow to 2040… as will renewables.” This is inconsistent with the IPCC’s analysis, which shows oil and gas use must both begin to decline by 2030 if we are to hold global warming to 1.5°C without carbon capture and storage becoming viable. Coal miners Whitehaven Coal and New Hope are two of the most obvious examples of companies driving us towards climate catastrophe. The IPCC tells us 1.5°C means coal’s share of the global energy mix will fall by around 70% by 2030, and be practically non-existent by 2050. Glencore, one of the biggest coal miners in the world, seems to at least be coming around to this reality, having committed to cap its coal output. But both Whitehaven and New Hope are still planning massive coal mine expansions, and telling investors there will be growing demand for coal in Asia for decades to come. What they fail to mention is that those demand projections are based on a scenario that would see catastrophic global warming of around 4°C! Super funds were given their chance to tell Whitehaven to bring its plans into line with the Paris Agreement at the company’s 2018 AGM, but only one (VicSuper) has confirmed it voted for this action. 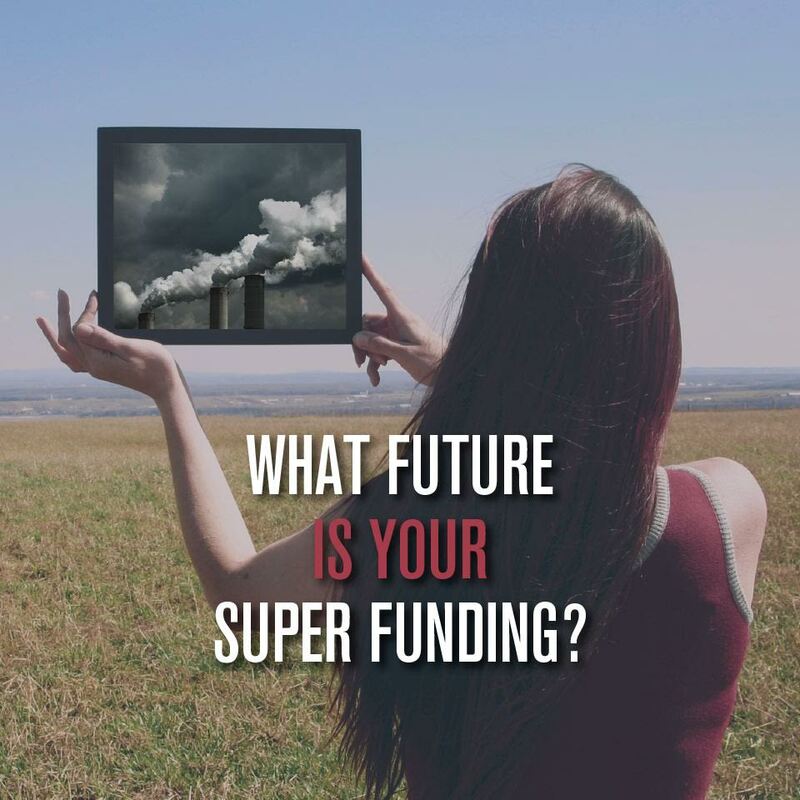 Some funds exclude investment in coal companies like Whitehaven and New Hope, and this is the kind of action we need to see from all super funds that want to play their part in avoiding runaway climate change. But what about coal mining’s contribution to Australia’s economy? Well, Whitehaven has paid $0 in tax in the last three years! Although the company was able to stump up $50,000 for political donations during that period. Take action: tell your super fund to ditch climate-wrecking companies like Whitehaven Coal and New Hope! Worth a combined $50 billion, Santos, Woodside and Oil Search are amongst the largest Australian companies actively undermining the goals of the Paris Agreement. All three have faced increased shareholder pressure over climate change in recent years, but this has done nothing to put them off their plans to increase fossil fuel production. It’s now time for investors, including our super funds, to stop supporting these companies’ climate-wrecking fossil fuel plans. According to the IPCC’s 1.5°C scenario analysis, natural gas use is expected to decrease by 13% – 62% from 2020 to 2050. This is completely inconsistent with Santos, Woodside and Oil Search‘s plans to increase gas production. 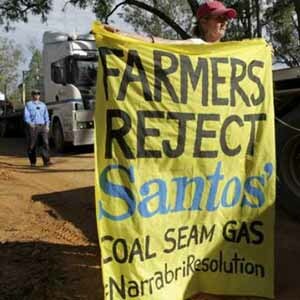 Santos has been public enemy#1 in the Narrabri region of Northern NSW for years now, with farmers, traditional owners, and other local community members vehemently opposed to the company’s plans to drill for unconventional gas in the Pilliga (Billiga) Forest. 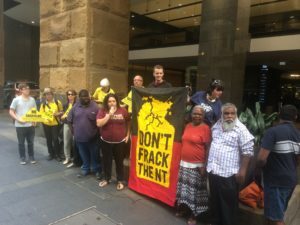 As if that weren’t enough, Santos also plans to start fracking for gas in the Northern Territory, another move that faces massive community opposition. The company defeated a shareholder resolution calling for climate risk disclosure at its 2017 AGM, the same AGM where Chairman Peter Coates said the company follows a “four degree pathway.” We are now well past the point of seeking disclosure from Santos. Our super funds must stop using our retirement savings to support Santos’ dirty and dangerous expansion plans. While Woodside’s largely offshore gas operations are somewhat more out of sight, for anyone concerned about climate change, they definitely shouldn’t be out of mind. Woodside’s annual greenhouse gas emissions, including those from the eventual use of its gas, are equivalent to around a fifth of Australia’s annual emissions! While countries around the world is moving to reduce their emissions, Woodside is planning to ramp up production by more than 20%. And almost every super fund in the country is funding those plans by investing our retirement savings in Woodside. Oil Search has at least recognised one of its projects would become unviable under a 1.5°C scenario, while the value of other projects would be eroded. Yet the company continues to pour money into fossil fuel expansion and exploration projects. If you have a super account, it’s likely some of that money is paying for Oil Search to keep extracting more and more oil and gas. All three companies are heavily involved in the Australian political system. Woodside regularly donates more than $200,000 a year to the major parties. Santos isn’t far behind, donating well over $100,000 a year since 2014-5. 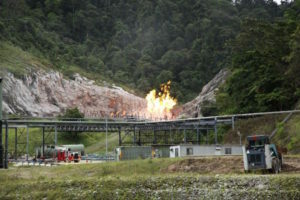 For its part, Oil Search is likely looking for taxpayer funding for PNG LNG, having made a submission to a Senate inquiry, supporting legislative changes that would enable more Australian public finance for overseas projects, particularly in the Pacific region. Take action: tell your super fund to ditch climate-wrecking companies like Santos, Woodside and Oil Search! 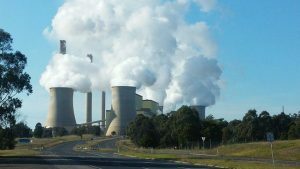 AGL expects to continue generating coal-fired power until 2048, and wants to build a gas import facility at Crib Point in Victoria, despite grave concerns over the project’s climate and environmental impacts. BHP is pursuing new fossil fuel developments, and bases its business on a scenario that would see us hit 3°C of average global warming. These companies have one last chance to fully align their plans with the goals of the Paris climate agreement. We are giving these companies this opportunity by coordinating shareholder resolutions calling on BHP, AGL and Origin to bring their strategies into line with a 1.5°C warming outcome. The best part about this is just about every super fund in the country will have the opportunity to have their vote on these resolutions. These resolutions will be the perfect test to determine which super funds are willing to throw their weight behind demands for meaningful climate action. Take action: tell your super fund to demand companies align with Paris, and ditch those that can’t or won’t! APA Group projects growth in its gas transportation business in the order of $2 billion over the next 5-10 years, including plans for new infrastructure to facilitate the expansion of Australia’s gas industry. Beach Energy has increasing oil and gas production targets out to 2023 and continues to allocate capex to expanding its reserves. Caltex continues to invest in expansionary fossil fuel infrastructure and repeatedly talks up the growth prospects of its Fuels and Infrastructure business without reference to a Paris-aligned scenario. Cooper Energy has a business model that is entirely reliant on finding and producing more oil and gas in South-East Australia. FAR is a pure play oil and gas explorer operating in West Africa, expecting to begin oil production in 2022 and gas in 2024. Karoon Energy is a pure play oil and gas explorer seeking to find and develop new fossil fuel reserves. In forecasting oil demand growth, the company refers to the IEA New Policies Scenario, which the TCFD projects will generate warming of 4°C. Liquefied Natural Gas is developing new LNG export terminal projects in North America. The company has projected global LNG demand using Shell’s interpretation of various outlooks by IHS Markit, Wood Mackenzie, FGE and Poten & Partners data which are generally based on current trajectory or business as usual scenarios. New Century Resources holds a 70% stake in US-based Kodiak Mining Company, which is attempting to develop the Kodiak Coking Coal Project into an operating mine. Senex Energy is a pure play oil and gas company which is conducting a “transformational growth agenda,” which involves tripling capex on exploration and development from FY18 – FY21. Seven Group Holdings owns 25% of Beach Energy (see above), and is further expanding fossil fuel sector through its other Seven Energy assets. Sundance Energy is a pure play oil and gas company with plans to increase exploration and production. Viva Energy operates an oil refinery business, which it intends to expand in coming years. The company’s 2018 prospectus refers to Wood Mackenzie demand projections. Neither of WoodMac’s Base Case or Carbon Constrained scenarios is consistent with the Paris climate goals. Take action – Tell your super fund to ditch these climate-wrecking companies! Research comprises all companies presented on the asx300list.com as at 1 Jan 2019 (295 in total). See asx300list.com for its own list methodology. Companies were grouped according their sector as listed on asx300.com. The following processes were applied to reflect each group’s exposures to transitional climate change risks and opportunities. Is the company required to report under the NGERS or does it have combined scope 1 and 2 greenhouse gas emissions equal to or greater than 50 kilotonnes CO2-e? YES – Does the company have a SBTI-accredited emissions reduction target and clear plans to achieve that target? Comprised of Financials sector companies, which is identified by the TCFD as one of the “sectors potentially most affected by climate change”. Has the company demonstrated how investment decisions (investment portfolio, loan book, or underwriting portfolio) will align the business’ operations with a Paris-aligned scenario? Does the company own fossil fuel production, processing or energy generation assets (coal mines, oil or gas fields, oil or gas pipelines, coal / LNG ports, baseload coal or gas power stations, or oil refineries)? NO – Does the company provide services to facilitate fossil fuel exploration, production, transportation, or electricity distribution? YES – Has the company demonstrated how its strategy (involving capex decisions, remuneration and emission reduction targets) is aligned to a Paris-aligned scenario? Comprised of Energy sector companies, which is identified by the TCFD as one of the “sectors potentially most affected by climate change”. Does the company rely on scenarios that overtly fail to meet the goals of the Paris Agreement when discussing future plans or prospects? 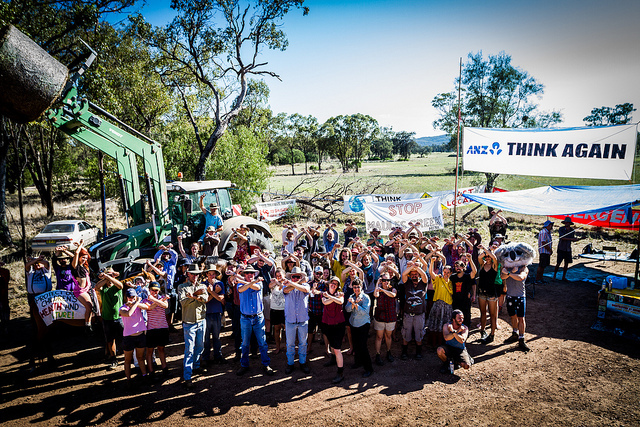 NO – Is the company attempting to expand the fossil fuel industry? NO – has the company demonstrated how its strategy (involving capex decisions, remuneration and emission reduction targets) is aligned to a Paris-aligned scenario? For all ‘out of line’ companies: Has the company made substantial progress towards strategy alignment?